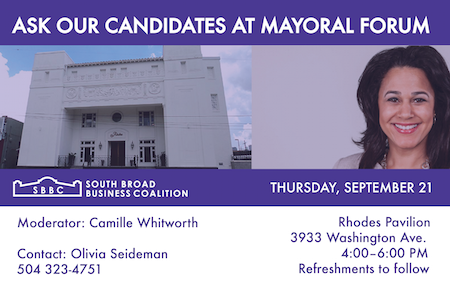 Please join the South Broad Business Coalition, a group of small business owners along the S. Broad corridor, for a Mayoral Candidates Forum on Thursday, September 21 at 4 p.m. at the Rhodes Pavilion, 3933 Washington Ave. The questions posed to the candidates will focus on economic and workforce development, economic inequality and wealth disparities, and public safety (crime and water management). Camille Whitworth will moderate the forum. Please RSVP here or register at the door. In advance of the event, we welcome the community to submit questions they have for the candidates here. Doors open to the public at 4 p.m. Refreshments will be served, with the forum itself to begin promptly at 4:15 p.m. It will be divided into two parts: an hourlong session with questions from the SBBC and a half hour of audience questions. Questions? Contact Olivia Seideman at oseideman@gopropeller.org or at 504.323.4751. The South Broad Business Coalition is a community of small businesses and neighborhood organizations located on and around the South Broad Street corridor in New Orleans, LA. Initially founded in 2009, the South Broad Business Coalition (SBBC) exists to promote the local economy and foster community engagement. District B candidates debate police, Sewerage & Water Board, taxes, AirBnB, chain stores and other issues (full video) Danae Columbus: In an era of political division, what messages resonate with New Orleans voters?